Beats 2.0 – Coming Rosh Chodesh Adar! Shmueli-2 Available for Pre Order! Yoely Greenfeld is a chasidishe singer who has put out several albums before and also sings at many weddings and concerts. His previous albums include last years critically acclaimed Beats with the Evan Al Orchestra. He also put out an album a year before that (2013) called Tizakeinu and one in 2011 called Hamivurach Misbarech. He also sang on the very excellent Shir album from Shlomo Yehuda Rechnitz (even though his song wasn’t so excellent). All of his albums (except Beats) have been produced by Naftali Schnitzler, but I have to say that this one stands out more than the others. On that note, let’s talk about this album. Zeh- This song is the right one to start off this album! Already heard at Chanukah mesibahs worldwide, this song is making waves. 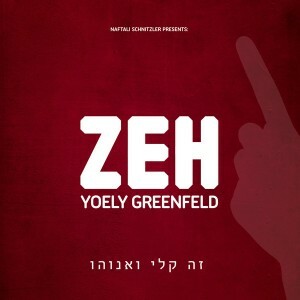 When i heard the backing vocals of Yossi Green, I said to myself of course it was Yossi! This song really hits the spot and apparently the concept for the song was created by Motty Illowitz, so he gets a shout out too. Great song and the choir from Moishy Kraus and the music arranged by Naftali Schnitzler are great on this track as well. Uleiynu- Although in the beginning the music reminded me of elevator music, once you get past that you get another beautiful song composed by Yossi Green. I gotta say that Yossi’s lyrics in these 2 songs are so basic it makes it that more amazing. This time he took the lyrics straight out of every day davening and Yoely adds a lot with his heartfelt singing. This time the music was arranged by Yehuda Gilli. Hoidu- This song is a fantastic song composed by Shlomo Yehuda Rechnitz, who has quite the number of hits under his belt. The song has a great beat and feel and makes you want to get up and dance. There’s a heavy amount of trumpet that I’ve started to notice on this album which means good old school music. This song had its musical arrangements done by Moshe Laufer and choir conducted by Moshe Roth. Umar- A very nice slow song composed by the incredible Pinky Weber who also guest solos on the song. The words are from the famous ending of a few masechtos and are also found in davening. The choir in this song is excellent and Pinky’s voice is a fresh addition especially during the duet. The excellent musical arrangements were done by Yehuda Gilli. Hazon- This song is the wedding hit that I’ve already heard a second dance start with. The intro itself is an incredible piece. The song is another Pinky Weber composition and it seems like another hit. This song brings a bit of the newer aged music but I enjoyed it immensely. It’s one of my favorites of the album. Tefillah Imohois- A gorgeous song that takes its lyrics from Shabbos candlelighting. I feel like I’ve heard a similar song but I cant quite figure out what it was, so if somone can figure it out, please let me know in the comments. The child soloist is Yossi Weiss and the song was composed by Motty Illowitz, composer extraordinaire. L’Chaim- An interesting song, but it’s very well done. Composed by Yitzy Waldner, it’s not a hit, but a very nice song nonetheless. The music is very good on this track, especially the electric guitar solo in the middle. Musical arrangements were done by Naftali. Al Naharois- Also composed by Yitzy Waldner, this one is a haunting slow song that really shows off Yoely’s gorgeous voice. With the choir arranged by Moishy Kraus and music arranged by Eli Klein and Yitzy Berry, everything comes together nicely for this song. Rachmonah- Released as a single a few weeks back, this song starts off slow but then has a fast high part. It was composed by Meir Adler and fits Yoely perfectly. The choir in this song is great as well, arranged by Moishy Kraus. The song definitely has a newer age music feel to it but it’s great to dance to. Tzizamen- This song is so lyrically awesome, it takes 2 pages to write them all out in the cd booklet. It was composed by Dudi Kalish who also arranged the choir and guest sings on the track. The lyrics were composed by Motty Illowitz. Dudi has a nice voice and adds depth to an already deep guest soloist album. Avinu Malkeinu- At the end of this 11 track album, Naftali decides to put in his own composition. It’s a nice song with the lyrics from the various Avinu Malkeinus that we say. A nice slow song to end off a terrific album. In conclusion, this album is definitely Yoely’s best effort yet. I look forward to seeing what Yoely will do in the future. If you have liked Yoely previously, buy this album and hear a new, fresh, and fantastic Yoely. Even if you just want to hear some new jewish music, buy this album, it’s one of the best new albums out there. And for all your jewish music hock, follow me at @JMROneWeekLater and keep it on jewishmusicreport.com. Enjoy!